For some of us, grilling season never ends. If that sounds like you (or someone you know and love), get in on our Great Grilling Skewers Giveaway, pronto! Three Appetite for Health fans will win 3-piece grilling skewer sets from American Skewer Company ($39 value each). You’ll have these for many years of happy grilling (or you could give them as a gift…if you can part with them). 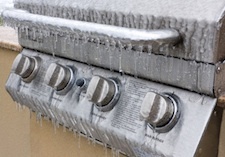 My grill still sees use in the winter and I live in Maine (see pic at right for an unfortunately typical scene)! It’s worth it to me to hoof it through snow/ice to grill in the winter months. Why? Grilling lean protein is an effective way to keep meat, poultry or seafood on the lighter side—and away from the heavier winter-time cooking methods (like breading and frying) that weigh down your meals with excess fat and calories. Plus, it’s quick, easy and of course, it tastes good. And if I close my eyes and stand sorta close to the heat of the grill, I can conjure up a few fond summer memories, too. American Skewer Company loaned me a set of their skewers to test on my own grill and I was really impressed with their quality! These are not the flimsy supermarket skewers, or even the so-so ones you can get at the hardware or cookware store. These are no-foolin’, serious skewers that are heavier, longer and sharper than any I’ve ever used (be careful!). In fact, my grill was too small to handle them, but I made do anyway—just closed the lid right down on them (not on the nice wood handles though) and it was no problem. Food stays in place on these skewers—no spinning kebabs here! 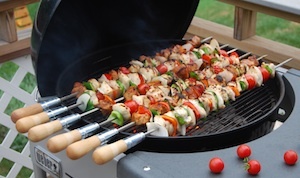 Want to try and win a set of these awesome skewers in our Great Grilling Skewers Giveaway? Here’s what to do: First, “Like” Appetite for Health on Facebook AND then “Like” American Skewer Company on Facebook as well. Then just leave us a note in the comment section below this post telling us what your favorite kebab combo is (I’m partial to souvlaki-style chicken with cherry tomatoes and green peppers). Enter by Sunday, December 2nd at midnight). This contest is open to US residents. For some extra consideration, share this contest (or any AFH content) on your social media and tell us where you shared! We like Steak, Mushroom, Zucchini, Onio, Peppers – marinated and served with rice. I love shrimp, pineapple, green peppers, onions, and mushrooms. Can’t wait to try my combo on these cool skewers! I’m love Shrimp kebab with red potatoes, assorted bell peppers & onions. I like chicken, peppers in pretty colors, and tomatoes–maybe squash chinks this time of year. I marinate chicken in beef chunks in seasoned soy sauce. Add a few mushrooms and green pepper and you have goodness on a skewer! A family tradition was to use a huge assortment with chicken, steak, shrimp, cherry tomatoes, squash, mushrooms and bell peppers. Shrimp, beef and chicken (marinated separately) with assorted cherry tomatoes, green peppers and onions in-between. I like all the variety I can get. I already subscribe to your newsletter and have “liked” American Skewer Company. I checked out their web site as well. It’s too bad they don’t sell wrap-around skewers when you want to keep the grill lid closed for cooking. Otherwise, I know if I won these, I’d say goodbye to the oven for the winter and beyond. My favorite kebab combo is Lemon Pepper sprinkled on chicken, onion, green pepper, cherry tomatoes, mushrooms and yellow squash. Make up a big batch of yellow rice and cut up some fresh fruit and you’ve got a wonderful meal! Love that fact that they are made in Michigan! As an Air Force brat I spent my grade school years in St. Clair Shores, Michigan. We load our Kabobs down with chicken, steak, shrimp, peppers of all colors, tomatoes, mushrooms, onions, squash…really anything and everything! Hmmm, guess my favorite would have to be onions, peppers, and nice juicy cuts of steak.which of course have been marinated. Gotta sprinkle some garlic on as well. Yummmm! I like beef, mushrooms, pineapple and zucchini on my kebob…yum! All summer long we BBQ and mostly skewers as we love all the veggies with chicken and shrimp. This past summer, one of my daughters skewered different types of seafood and it was heavenly I have never seen skewers that big and with my large family, they would be a godsend! Shared! Beef, shrimp, onions, mushrooms & green peppers, oh my! I am getting hungry just thinking about it! I enjoy Teriyaki chicken and pineapple skewers the most. Spicy shrimp with bell peppers and onions is close behind. These skewers look amazing..we grilled out tonight 78 degrees here in OK! I prefer beef and lamb with squash, onion and peppers. I love the chicken and pineapple combo with spices. I would LOVE to have these! May favorite kabob is Philly Steak with cheese and steak sauce. I follow you and American Skewer Company on Facebook as Dani Freeman. My favorite skewer combo is beef, cherry tomatoes, mushrooms, onion, and green pepper. We love to use barbecue skewers on all types of food. We love the many varieties of colors, flavors, aromas, shapes & sizes, textures, and quantities from each barbecue skewers. It surely brings a bountiful array of different types of assorted food on our plates. It’s just simply lovely! Dani K., Christine K., Stephanie S.
Look for an email from me later today (be sure to check your spam folder as well just in case). I’ll let you know how to claim your skewers! Thank you! =] These look great! I love cooking on the grill just recently an elderly woman in our park gave us here huge grill she had we cleaned it up and it looks and cooks amazing foods. I love cooking everything on my grill. This grill also has a side burner so when cooking steaks I can havce a side pf mushrooms and such cooking in butter to top our steaks with.